If a particular state doesn't offer the option to buy lottery tickets directly from their official lottery website, then players can consider using an offshore messenger service. The internet offers various opportunities to buy lottery tickets online legally through offshore lottery agents that cater to the U.S. Buying online lottery tickets through these lottery messenger sites is an alternative for players in states that do not allow traditional online lottery sales. Some states do have their own Mega Millions or Powerball version of online tickets although players must reside in those states in order to purchase these tickets over the Internet. Since this option is only available in a few states so far, most players in the US opt for using lottery messenger services such as the ones listed on this page. It has turned out to be a convenient alternative for those individuals who are unable to make it to the local convenience store or another lottery retailer to purchase tickets in person. Is It Legal To Buy Online Lottery Tickets In The United States? Buying lottery tickets online is perfectly legal in the United States. In 2011, the DOJ released a formal opinion stating that the Federal Wire Act only applied to sports betting and did not affect other forms of online gambling, including lottery games*. This is why you've seen a few states now offering players the ability to buy their tickets online through state-regulated options. There are not any state or federal laws that prohibit American residents from purchasing lottery tickets online through licensed and regulated online lottery messenger services or agents. *Update: The DOJ 2019 Opinion on the Federal Wire Act infringes upon how domestic lottery operations will be conducted. The new Opinion states that lottery operations in states which allow it must be localized and that information cannot cross state lines. This could affect multi-state associated lottery operations like Megamillions and the Powerball. For now, the best option is to utilize licensed offshore online lottery sites until the domestic issue is resolved. By combining global messenger services with the worldwide reach of the Internet, for a nominal fee, legal online lottery agents purchase tickets for you on your behalf. Those tickets are then scanned and the images e-mailed to you, and if you win big, these companies will even help you collect. Many of the sites offer tools which help you choose the lotteries which offer the best odds, you can filter the games by jackpot size or draw dates and you can improve your odds by joining lottery syndicates, or arrange for automatic purchasing of your favorite lottery tickets every week through a subscription service. You can learn more about these agents by accessing our online lottery site reviews. WinTrillions is the messenger service we recommend for US players. In business since 2005, WinTrillions has been providing players a transparent and legal way to play lotteries from all over the globe from the comfort of their own home. Whether you are looking to purchase your Powerball tickets, or want to join a syndicate and play some of the biggest lottery jackpots in the world, WinTrillions is one of the better choices. 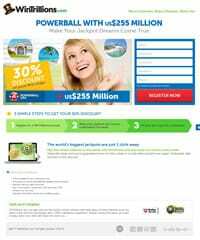 Where Can I Buy Mega Millions Lottery Tickets Online? Players fortunate enough to live where state-regulated online lottery services are available can typically also purchase their Mega Millions Lottery tickets there as well as tickets to the state lottery games. Other players can legally buy Mega Millions Lottery tickets online through the lottery agent you see mentioned above. With the jackpot listed as $970 Million dollars as of October 18, 2018, players don't want to skip the drawings for this game! Buying lottery tickets online has become an easy and convenient solution for US players. How then, can a consumer know if a website is legit, safe, and secure? To ensure that you understand the nuances of using a reputable and legitimately licensed lottery service, a list of frequently asked questions is available below. The list answers the questions on legal issues, choosing your numbers, and purchase options. Is Playing Online Lottery Legal In The USA? Upon the DOJ's legal opinion concerning the Federal Wire Act, the regulation of lottery games is left up to each individual state, with no federal laws in place that prohibit players from participating in online lottery games or from visiting licensed lottery agents online for the purpose of purchasing lottery tickets or subscription services. Currently, there are approximately 42 states which offer one or more state lottery games and/or that participate in the multi-jurisdictional lottery games such as Mega Millions and Powerball games. Several of these states, including Georgia, Illinois, and Minnesota already have a process in place that supports online ticket purchasing, while other states, including New Hampshire, New York, North Carolina, North Dakota, and Virginia have integrated state-sanctioned online lottery subscription services. Several states, including California, allow private lottery agents to provide online lottery subscription and lottery ticket purchasing services to players. The caveat is that you must be a resident of one of these states in order to be eligible to register for and participate in the state's official online lottery ticket services. Residents of all states can legally utilize the services of the lottery messenger agents listed on this page. Can I Use My Favorite Numbers When I Buy My Lottery Ticket Online? A lottery syndicate is where a group of people buys a lottery ticket to increase their chance of winnings. This allows them to buy even more games. More games mean more chances of winning. If the syndicate wins, the prizes are divided up evenly among the group. The syndicate is not limited to individuals, but businesses and entities as well. What Is A Lottery Subscription Service And Are There Advantages To Using Them? If I Purchase A Ticket Through A Lottery Agent, How Do I Know If I Won? If My Ticket Is A Winner, How Do I Claim My Winnings? For winnings below $600, winnings are typically credited to your online account. You can purchase additional tickets or withdraw your winnings. For any winnings above $600, you will receive a personal call from the lottery site to arrange payment. Do These Sites Also Offer Scratch-off Tickets? Is Buying Lottery Tickets Online Safe? The online lottery sites that we endorse are all legally licensed and regulated in their respective jurisdictions. Keep in mind these are huge companies with deep pockets that have been in business for years, so it's 100% safe to do business with these companies. They guarantee payment on winnings and will facilitate the collection process with their winners' support team dedicated to helping players claim winnings. Many of these sites offer a rewards program similar to what you would find in Las Vegas. The more tickets you purchase, the more rewards and special promotions will be available to you. Each website offers a little something different, so it doesn't hurt to spend a few minutes familiarizing yourself with the inner workings of their VIP program. Powerball – The largest jackpot in the game's history, and the largest single prize ever on one ticket, was the $595 million mentioned above. Consistently above $60 million, and routinely over $100, the jackpot here is always one of the biggest in the world. There are 9 levels of prizes awarded in the 45-state combined lottery, and Powerball is drawn twice a week. Mega Millions – Starting at $15 million and supported by multiple jurisdictions that cause it to grow rapidly, the US Mega Millions lottery has issued a $656 million jackpot (3 winners), a single ticket $319 million payday and a $648 million jackpot split by 2 ticket holders, with all of those wins recorded in just a 32 month period ending December 17, 2013. Fast forward to October, 2018 and the jackpot is looming at just under $1 Billion. Mega Millions is drawn twice a week. EuroMillions – Delivering Europe's biggest lottery prizes and a guaranteed €15 million jackpot, EuroMillions began making millionaires in 2004 with a twice-a-week draw. Jackpot totals of €190 million ($256.8 million), €187 million ($252 million), €162 million ($219 million) and several over €80 million ($108 million) have already been won playing EuroMillions. Australia Saturday Lotto – With a 6/45 structure and 6 pay levels, you have a 1 in 85 chance of winning some prize in the Australia Saturday Lotto. Currently offering a guaranteed $4 million first prize and regularly paying as much as $30 million or more, the Australian Saturday Lotto boasts some of the best odds of any lottery in the world. La Primitiva - Spain's weekly La Primitiva is the oldest national lottery draw in the world, running since 1812. With its 6/49 structure and 6 prize levels, it is very attractive statistically. The record jackpot is €30 Million and you have a 1-in-10 chance of winning a cash prize due to the many levels of prizes awarded. La Primitiva pays out more than €1 Billion annually. Florida Mega Money – choosing just 4 out of 44 numbers with a Mega ball, and delivering 8 levels of winning, the Florida Mega Money lottery is a smart statistical play. This makes your overall Jackpot odds just 1 in 2.98 million, one of the most favorable of any lottery in the world. You also enjoy a 1 in 12.58 chance at winning some prize. Powerball - Arizona (AZ), Arkansas (AR), California (CA), Colorado (CO), Connecticut (CT), Delaware (DE), District Of Columbia (DC), Florida (FL), Georgia (GA), Idaho (ID), Illinois (IL), Indiana (IN), Iowa (IA), Kansas (KS), Kentucky (KY), Louisiana (LA), Maine (ME), Maryland (MD), Massachusetts (MA), Michigan (MI), Minnesota (MN), Missouri (MO), Montana (MT), Nebraska (NE), New Hampshire (NH), New Jersey (NJ), New Mexico (NM), New York (NY), North Carolina (NC), North Dakota (ND), Ohio (OH), Oklahoma (OK), Oregon (OR), Pennsylvania (PA), Rhode Island (RI), South Carolina (SC), South Dakota (SD), Tennessee (TN), Texas (TX), Vermont (VT), Virginia (VA), Virgin Islands (VI), Washington (WA), West Virginia (WV) and Wisconsin (WI). The following resources are helpful to lottery players and offer useful information such as winning numbers, past winner bios and more.